Rebecca W. She won with an entry from following Yoplait on Twitter. 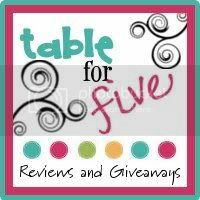 Thank you all for entering, and thank you MyBlogSpark and General Mills for sponsoring this giveaway! Yoplait Go-Gurt Yogurt and MyBlogSpark Target Gift Card and Go-Gurt Giveaway! MyBlogSpark and Yoplait Go-Gurt Yogurt have teamed up to offer my readers a fantastic new giveaway! Now, on to the giveaway! As I mentioned above, Yoplait has teamed up with MyBlogSpark to offer readers a $25 Target gift card and several coupons for FREE boxes of Go-Gurt. Enter below through Rafflecopter. You can find more information on this offer, as well as more recipes, coupons, and promotions on the Grocery Savvy website. 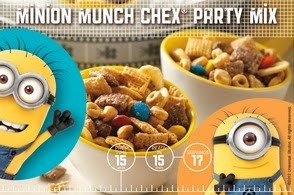 MyBlogSpark has teamed up with General Mills to make it possible for you to win three boxes of Monster Cereal AND a $25 Target gift card! This is a great giveaway, and I'm grateful to both MyBlogSpark and General Mills for allowing me to share this opportunity with readers. To enter, complete at least the first (or all) of the entries via Rafflecopter below! Congrats to Deana! She won the Green Giant Giveaway by liking Green Giant on Facebook. Come back in a few days if you'd like another chance to win a prize. I will be posting another MyBlogSpark giveaway with General Mills Monster Cereals and a $25 Target gift card prize package SOON! 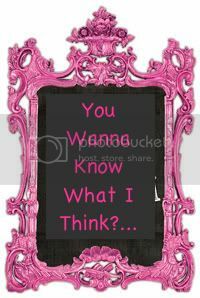 Have I mentioned how much I love MyBlogSpark? They have some of the best campaigns, and they are so generous with their giveaways for readers. This time, they have teamed up with General Mills for their "Green Giant Make a Giant Difference" campaign. This is one prize package you don't want to miss! Before the holidays are upon us, it's a good idea to start thinking about getting in shape so you're ready to make good decisions at holiday gatherings. Green Giant has made it easier than ever to get the nutrients you need while eating yummy foods with their boxed frozen veggies. I LOVE the picture on the Green Giant website that shows you what you can eat that has only 100 calories in it. VERY GOOD VISUAL! I can eat an entire bowl of Green Giant veggies or about five chips. Hmmm...no contest there :) The website also has lots of great information such as amazing recipes, fan interviews, a veggie challenge app, and lots more. Here are few of the boxes I was able to try by participating in this Spark. 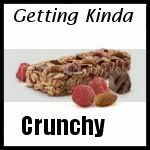 They have so many good varieties, some of which are 100 calories for the entire box! You can view all of their boxed frozen veggie choices HERE. Did I mention these steam in the bag? I LOVE steam in the bag veggies! They are so convenient! To enter, complete at least the 1st entry on Rafflecopter below. You can complete the other entries for a better chance of winning! Cici's Pizza Drink Up Summer Promotion! Disclaimer: I was given a $25 gift card from Cici's pizza to share this promotion with my readers. If you are looking for a way to stay cool this summer, check out Cici's Pizza Drink Up Summer Promotion. Not only is Cici's offering up its endless buffet for only $5 throughout July, but you can also win a VIP vacation via an Instagram contest. See below for more information! – CiCi’s Pizza is offering sizzling opportunities with its “CiCi’s Drink Up Summer” promotion, giving CiCi’s fans the chance to win VIP vacations, grab instant-win prizes and get lucky with an Instagram contest. 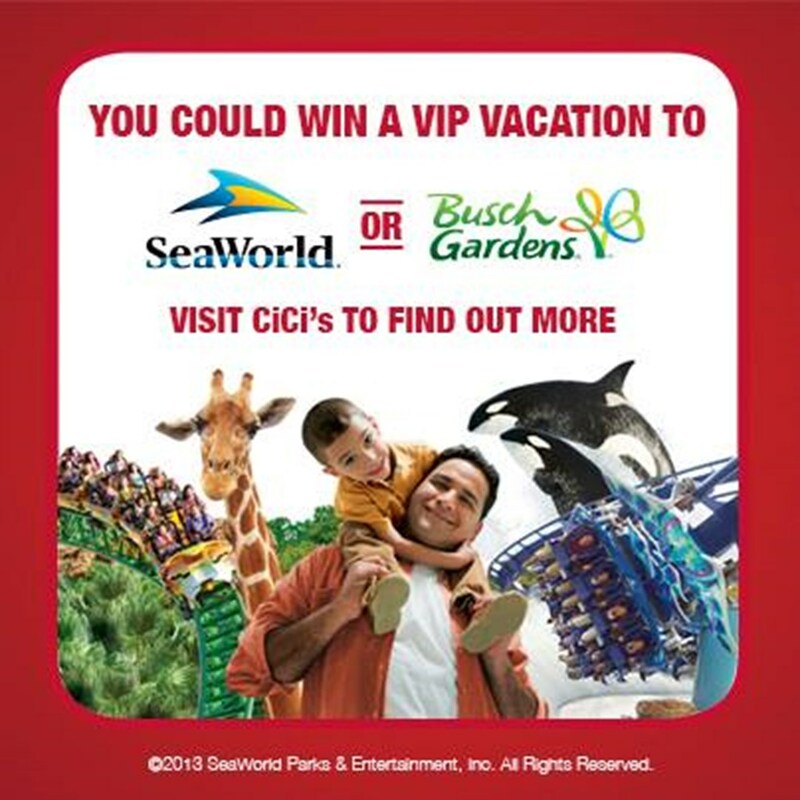 Through Sept. 1, guests can visit their local CiCi’s for details on how to win one of four VIP vacations, one-day passes to SeaWorld or Busch Gardens or $25 in CiCi’s gift cards. Grand prize vacations include: VIP tickets for four to one of the theme parks, round-trip airfare for four on Southwest Airlines®, two hotel rooms for two nights and $200 spending money. Guests can enter to win additional prizes by following CiCi’s on Instagram (@CiCisPIZZA), where each week CiCi’s will feature a summer icon badge from its 32 oz. cup. Guests are encouraged to take a photo or video of themselves with their cup and upload it tagged with @CiCisPIZZA and #cicisdrinkupsummer. Each week, CiCi’s will randomly choose Instagram winners to receive $25 CiCi’s gift cards. In addition, throughout July, CiCi’s is offering its endless pizza, pasta, soup, salad and dessert buffet for just $5 at participating restaurants. Participating parks include the three SeaWorld parks in Orlando, Fla., San Diego and San Antonio and the two Busch Gardens parks in Tampa and Williamsburg, Va. Thank you so much to all of you who entered! I used Rafflecopter for the first time, and it seemed to work out okay. The winner of the giveaway is John H.! John, please respond to the email I sent you so I can forward your info to MyBlogSpark! “Disclosure: The information and prize pack have been provided by General Mills through MyBlogSpark. While I can't with a good conscience tell you to feed your kid cookie cereal for breakfast most mornings, I can say that I think it's a great dessert alternative or a wonderful treat on special mornings. 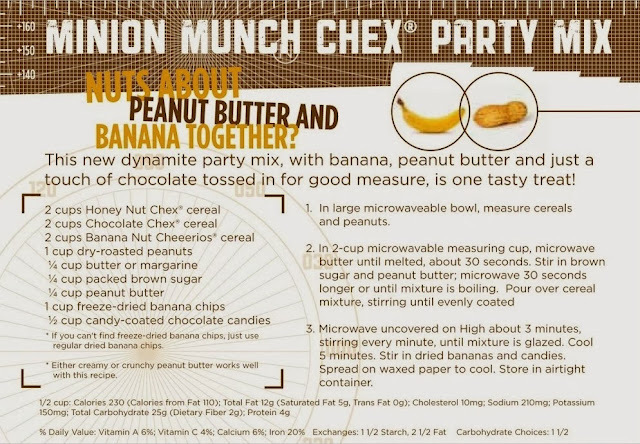 And....General Mills and MyBlogSpark have graciously donated an extra prize pack just like the one I was given so you can try this cereal out for yourself. This is a mad sweet prize pack! I LOVE the dispenser. It's super fun for kids (and adults), and the cereal bowls for breakfast on the go are unique and fun too! Overall, this has been one of my favorite giveaways to do on this blog because the prize pack was so fun, and I'm excited that one of you is going to win one!!! I'm going to give Rafflecopter a go for the first time, so I hope this all works out okay :) Thanks so much for entering and good luck!